COMET 203598 (A-DF) - OEM SPEC BELT 994-120 for Comet 30 Series Go Kart. In stock! Comet 203598 (A-DF) Go Kart Belt. 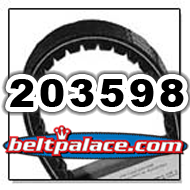 Replacement belt for Comet 30 series Belt 994-120: COMET 203598 and 203598A. Replacement for 994-120 OEM Torq-a-verter belt. 3/4"top Width x 37-7/64" L. Asymmetric Cogged belt. Also used in ATVs, Golf Carts, Snowmobiles, and Power Scooters.